There are a few exercises I actually like but “loaded carries” which often come with names like Farmers Walk, Waiters Walk, Duck Walk and Suitcase/Briefcase Carry float my boat. These walks and carries are the classic strength building and endurance exercises, which basically consist of walking under weighted loads. As my evil buddy used to says “Pick heavy sh*t up, and carry it son” and they are amongst the few which I genuinely enjoy. Basically it involves picking up an object heavy or not, unilaterally or bilaterally, carrying said object in a certain position and/or style. It really is that simple. Walk for speed, Walk for distance, Walk for time, but keep on moving. These walks, carries and movements are full body workouts. They are cardio, strength and endurance training all in one. Its a killer fat burner, muscle builder and overall health builder. Getting “yoked” is what happens to farmers, huge neck, traps, rhoms, delts, shoulders, backed up by a powerful back and popeye worthy forearms. The epitome of “yoked up” farmer style is Mark Westerby. Mark were farmer, who one day stumbled into a local strongman event with his friend, and decided to enter likely in support. Unlike most other strongmen who were strength athletes or gym trained, Mark won the event in 2003, he went on to win his first national contest 2 yrs later in 2005. 2 yrs later he entered Worlds Strongest Man 2007, and placed just shy of a podium (top 3). Still from farmer to top tier worlds strongest people. This is a simple farmer who were “yoked up”, and in a few short years stormed the stongman world, so don’t underestimate loaded carries which are named after the humble farmer of old. You can use dumbbells, barbells, weight plates, kettlebells, sandbags, wheelbarrows, stones, kegs, furniture, the bodies of your slain enemies, children or anything else you can grab a hold of. 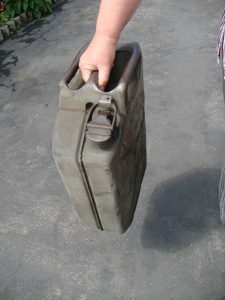 I have known people to use briefcases, holdalls, suitcases with weights, sand or other stuff inside them. I personally in a pinch used 5lt water bottles which cost £1.06, filled them with sand or water. In recent times I have used 20l Jerrycans and 18.5L water cooler bottles which both clock in close to 20kg with water, closer to 30kg with sand and close to 36kg when you pour water into bottle with sand. Water is unstable, and the more unstable or bulky the load the harder your workout becomes. There are specialist bars which can be used also. Farmers Walks, Hex / Trap Bars, Bulgarian Bags, Thors Hammer, Warhammers and more. You will need something to mark the course boundaries and set your circuit(s). Classic Line: Take a marker, weight plate or cone and place them either 10 meters for heavy carries or 25 meters for endurance carries apart. The Four Corners: Using 4 markers, weight plates or cones, place them in a square like : : roughly 10 meters apart, making a 40 meter square course. Including turning circle diagonal course is approx 15m, so if you do a |X| course, its nearly 55-60 meters. There are various others, the limit is really how insane or creative you are. I have known people put Reebok steps, flat ladders and various other obstacles along the way in triangles, rectangles, squares even dodecahedron (I may have made that last one up) shape courses. Go wild and make a pattern, the only rule I suggest is aim for at least 10 meters between points. I also suggest leaving room for a rounded return, sharp turns break your stride and slow your progress. Not to mention it breaks your concentration. Leave room to turn around each point smoothly, trust me! The original and classic loaded walk, this is the one you will have seen on TV in Worlds Strongest Man every year. 2 Weights, 1 in each hand, walk between Point A and Point B and back again. This is shown to work Abs, Lats, Obliques, Forearms, Glutes and Traps and Delts. Its hard on the lungs and cardiovascular system. Keep your head up, back straight and maintain form. Go heavy!. This is basically the unilateral, lowered arm version of the Waiters walk. It requires working the core and stabilisers to the max and touching the obliques to keep your body upright. 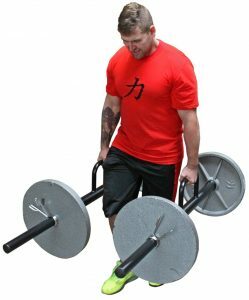 If you use both arms, it becomes a standard Farmers Walk as above. Some call a lighter carry a briefcase carry and a heavy load a suitcase carry. Keep your body even and stable, don’t lean to one side or the other. A variation which is part way between a suitcase carry and farmers. You use 2 weights of different weights in each hand, which creates an imbalance which makes your core and lower back work extra hard to keep you stable. As with the above, keep yourself balanced and even. If you think of an american style waiter carrying the tray of dishes or drinks above shoulder height or over the heads of diners, thats it. Its generally done unilaterally, if you do it with both arms its an Atlas Hold, Military Walk or Overhead Carry. Done unilaterally or 1 arm at a time, it puts extra pressure on your core, obliques and abs to stabilise your body. This is spectacular for building core strength and shoulder stability. Keep your shoulders down and back, and core braced. Don’t overload it, or risk injury. Think of a Soldier holding a weapon over his head to avoid it getting wet when wading through water. Perhaps in hollywood movies you’ve seen it as a punishment, making a soldier run with it overhead. Its the same thing, while an assault rifle is around 4kg, but you can go as heavy as you feel you are able. For a Military Carry, you should use a barbell or something along the same hold position as a rifle. Be careful as its easy to obtain a shoulder injury with this carry. Shoulders and core braced. Think of Atlas holding the world on his shoulders or over his head, and you’re there. You can use a medicine ball, a sand bag, kettlebells, dumbbells or anything. Your holder above your head like a ball. I favour sandbags as it gives my wrists and forearms a beating while doing an overhead carry. As above be careful with this hold. This is a strange one really, as its done 2 ways and both have different names, but I stick with High Duck Walk and Low Duck Walk. I did hear someone call the low walk a “Duck Waddle” which made me giggle. Basically, this move you are holding the weight between your legs either unilaterally or bilaterally. You can then either hold the weight low down with a bend in the knee and hip or a more upright position to move the emphasis. This is essentially a standing upright version of the Duck Walk, your holding a dumbbell or kettlebell at waist height with both hands. Don’t interlock your fingers and try not to raise the weight up with your arms or shoulder muscles, let it hang low. If you want to work your core hard, Zerchers are the way. Puts extra load in your abs, core and lower back. Be sure to keep your back straight doing this, leading forward puts excessive stress on your lower back. I always try to put my hands in a more natural position like \ / rather than pronate or suplinate, but fine where its more comfortable for you. This is related to the Zercher Squat (like a front squat only the weight is at chest height). This is more about removing the load from your shoulders, so don’t interlock your fingers, over lay your arms almost like your hugging someone. Your arms will be on fire in no time, your quads get a pounding and your core too. My friend and I pretty much made this up, its a very slow zig-zaggy walk with your arms outstretched in front of you like a front raise holding a plate out. We use 2.5kg plates to walm up and 5kg plates once warmed up. Its not alot of weight but its a fantastic delts work out. An adapation on the Zombie Amble, only this is arms out at the sides like a lateral raise and your walk fast, a brisk pace. Another killer delt and stabilising move.